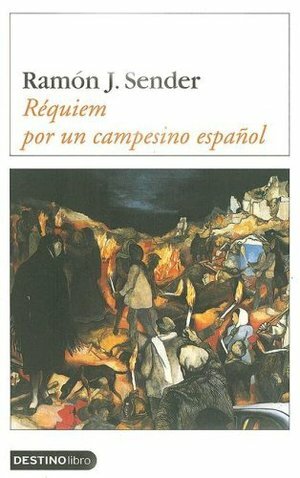 If Francisco Ayala’s La cabeza del cordero skirts the question of causes–and indeed, perhaps, of causality itself–preferring to see the civil war as an absurd irruption of violence that comes almost from nowhere, Ramón Sender’s Réquiem for un campesino español is, by contrast, all about origins. So much so, indeed, that his book, too, ends up stopping short of addressing the war directly. The story is told in flashback and counterpoint. A priest, Mosén Millán, is preparing to give the requiem mass for a young man–Paco el del Molino–who was killed a year previously. The church is empty save for an altar boy who flits around, humming or singing almost under his breath the ballad that has apparently already converted del Molino into a popular hero. Meanwhile, the priest thinks back over the intersections between Paco’s life and his own, as the church is a constant presence in everyone’s lives in this small village, from baptism to wedding and funeral. But never more so than in this case, as we gradually learn, and the story of Paco del Molino becomes the story of Millán himself. No wonder the book bore his name as its title when originally published, for it is less about the downfall of the young campesino than it is about the failures of the church. Paco el del Molino had been an altar boy in his time, and one day accompanied Millán on a pastoral visit to a gravely ill man in need of the last rites. But in Paco’s eyes, at least, it turns out that the man needed far more than this: for the visit takes the priest and his assistant to a scene of extreme poverty, where the people live in caves, with little more than rags to their name. Asking Millán about why such misery should exist and what might be done about it, Paco gets decidedly short shrift: “That’s how life is, and God has made it so for his own reasons” (38). For the boy, this isn’t good enough. But the times they are changing, and these changes affect even the most remote of villages. Some years later, elections are called and Paco is at the forefront of a group of councilors determined to fix some age-old injustices. They refuse to pay the absentee landlord for the right to graze their animals on his land. “What men have made, men can unmake,” he takes the liberty of telling the landlord’s majordomo (75). The entire social hierarchy, from the monarchy down, seems to be tottering as men and women like Paco start to question the unwritten customs that perpetuate gross inequality. The village is abuzz. The reaction is swift, sharp, and ruthless. Hired thugs come from the city and a massacre ensues. Only Paco has the sense or quick-wittedness to make good his escape and go into hiding. But this is where the long, intertwined history between the priest and his former acolyte, between the church and the people, reaches its tragic dénouement. For it is Millán who discovers the location of the rebel’s hideout, and gives it up to those in his pursuit. He even is persuaded to speak to del Molino in person, to convince him to hand himself in. He does so on condition that the fugitive will be given a fair trial, but he must know as well as anyone that such promises from the landlords’ men are worthless. Sure enough, before long the priest is forced to witness as they take the young man off for summary execution. And his response to Paco’s pleas now are as inadequate as his attitude to the cave-dwellers was before: “Yes, my son. You are all innocent. But what can I do?” (101). His “son” dies with the name of his spiritual father on his lips: “He turned me in… Mosén Millán, Mosén Millán” (104). A year later, waiting for the mass to start, in a church empty of all but the altar boy and his ballad plus (belatedly) representatives of the very men who put Paco to death, the priest has plenty of time to consider his betrayal. As an allegory of the war as a whole, Sender’s tale is reductive and one-sided. For one thing, this is a conflict without any actual fighting: Paco gets a couple of rounds off at his pursuers, but leaves them with no more than the lightest of injuries. The people are the purest of victims; their oppressors, the purest of victimizers. Yet strangely the church is allowed the virtue of at least embarrassment and regret for its failure to protect its flock. Which is why it is better to stress that this is a story of origins, a description of deep injustice and the sanctioned violence that kept it in place. No wonder people would go on to fight (in fact) tenaciously for the Republican side, inspired in part by the ballads telling of folk heroes such as del Molino. But in the end this novella is no more revealing than such a ballad, with its caricature villains and easy moral lessons. Surely the war deserves more than this.